If you're like us, you've been eating kale nearly daily for the last two or three months, and have another two or three months of the same ahead. Sure, the green is absolutely delectable sauted with a little balsamic vinegar, but at some point you're itching for a raw winter vegetable straight from the January garden. That's when you pull out this winter kale salad. The innovative part of this recipe came from Taproot Magazine. An article there explained how to use a bit of salt and elbow grease to wilt down your kale without heat. First, remove the big midribs, then slice the leaves up into small segments. Sprinkle a very small amount of salt on top (maybe 1/8 tsp to serve two), then use your hands to squeeze and mush the kale for two solid minutes. 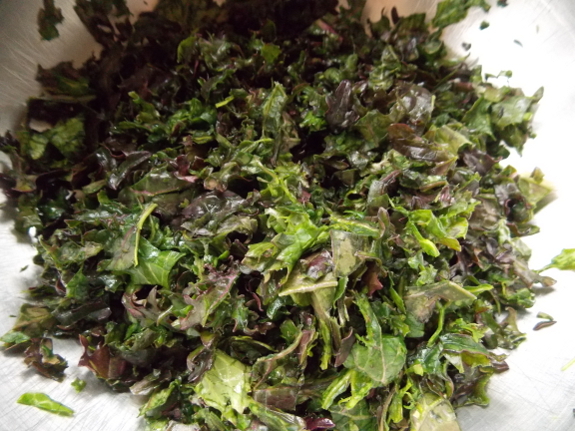 The kale will keep its delicious, fresh taste, but will be much more easily eaten raw. You can top the kale salad with whatever you want, but this is our current favorite. First, I grate a very small carrot (about 1/4 of a store-bought carrot size) into the kale, then I mix up a homemade salad dressing out of toasted poppy seeds, peach syrup that was supposed to be jam but didn't gel, some lemon juice to cut the sweet, a bit of olive oil, and a dash of pepper. I usually don't like salad dressings, but this one really works with the kale and carrots. Top it all off with a special store-bought treat --- avocados --- and you have a vegetable side that will disappear very, very quickly. Enjoy! Thanks for relaying that idea about softening with salt... Thank you for your wonderful homestead, blog, books, etc. Anna, it would be great if you posted the proportions/measurements for the ingredients, for the dressing, for your kale salad! Ah... I only WISH. We still had garden kale, but even the heartiest of our garden greens finally succumbed to below zero temps. This does sound good. I had an orange marmalade that didnt set up firmly, and might try that in a dressing as well. One of my artist friends has a saying - he says he "smuggles red" into every landscape painting. These little bits of red balance out the overwhelming green of the typical landscape., but they are hardly noticeable unless you start looking. Well, I pretty much "smuggle kale" ( or chard, or spinach, or turnip greens) into just about everything I cook, They have even been known to show up in desserts-. And now that I bought the dandelion book ( thanks for that tip!) maybe I will add dandelion greens to the list too! The other day, I made " stuffed grape leaves" -only used kale, or maybe it was chard... I boiled the leaves, minus the big stems, in a vinegar/ salt brine just till wilted, and used them to wrap up a filling.... New way to eat the greens and very tasty! 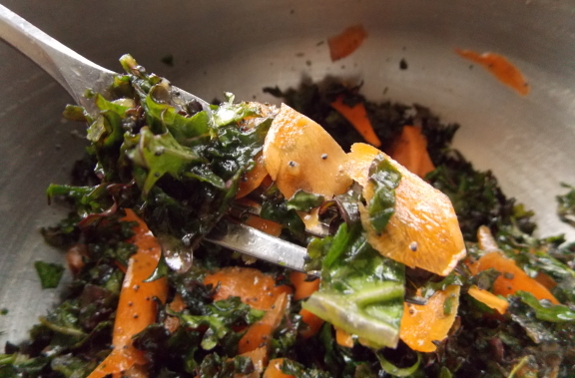 I do Kale salad all the time with just lemon juice, olive oil, salt, pepper, and a little parmesean and bread crumbs. Adding a little acid during the 'elbow grease' phase helps it break down, too. I've never done a full two minutes of rough-housing and it turns out fine. 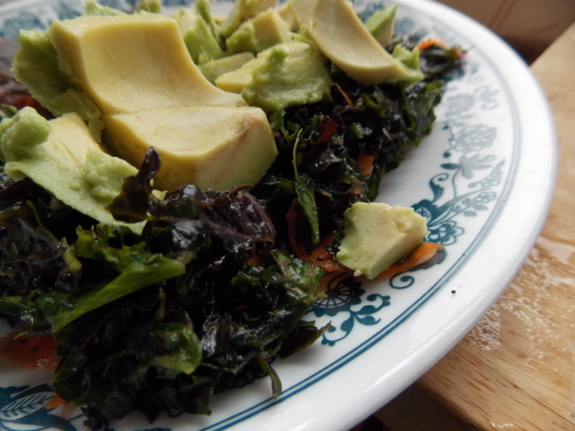 I remember reading, too, that you should always eat your greens (especially kale and cooking greens) with some fat since there are a number of fat soluble vitamins that will be unavailable without it. Has anyone else heard this, too, or am I making it up?